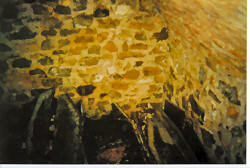 Several people had told me about a tunnel- or tunnels – under the Chancel floor in St Mary Magdalene Church at Trimdon. They went a: to the Fox & Hounds b: to Tremeduna, the site of the farm where the monks from Guisborough used to live and c: to Durham Cathedral. If they all really existed, the Church would have more tunnelling than British Coal – and the diocese would probably long ago have sunk down in subsidence! The story about one to the old farm was more credible. After all those old monks said their services at very strange hours – and they might have wanted a covered way into church. “RD” I worked out must be Roddam Douglas who, it appears, was a vicar of this parish, or as they were called at that time, the Curate of this parish. To get back to the main story, whether or not there was a tunnel under the church floo, there certainly was a vault somewhere! The trouble was that “fifteen feet from the end of the Chancel” could mean that it was in the Chancel itself – or out in the Nave, under the pews. And did “North East corner” mean of the church or of the Chancel? And how big a vault would it be? 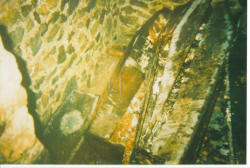 The Chancel floor had been very uneven for some years and was gradually getting worse. It was now difficult, if not dangerous, to walk on. The church architect had therefore said it should be levelled and given specifications, about depth of excavation, materials to be used, etc. We were about to put into church a new carpet costing thousands of pounds, so the floor had to be levelled first. We expected that work to cost many hundreds of pounds – probably a thousand. Then, lo and behold!, two village men, Jackie Dunn and Phil Robinson ( “Trimdon Floor Screeders” ), volunteered to do the job free of all labour costs! Their generous offer was accepted eagerly. Work in church has to have approval from the Diocesan authorities and from the Chancellor of the Diocese – a kind of ecclesiastical judge. We worked our way through all the rules and regulations and formal approvals, and the time came to start on the work itself. – under supervision from both the church architect and an archaeologist. Dennis Coggins, who retired from Bowes Museum in November ’88 agreed to act as archaeological consultant for us. He charged us nothing either! Th e day before excavation of the floor started, Easter Monday ’89, there was no sign of what was to come. Under the narrow strip of carpet leading through the Chancel there was an old stone with some indecipherable writing on it. That looked a hopeful place for discoveries. Jackie and Phil began to remove the tiles as carefully as they could, in the hope that they could be replaced on the new floor. Unfortunately this turned out to be impossible because of the way they had been originally laid – set straight on to concrete, which itself had been roughly laid on a load of rubble and old building material. Everyone was eager to lift the old stone in the middle, but we had to wait until Dennis Coggins arrived. Soon he came, the stone was lifted – and nothing at all was found! After the tiles were cleared, the rubble underneath had to be tackled. As the work progressed on Tuesday, two concrete slabs were uncovered, together with some signs of an original cobbled/slabbed floor. 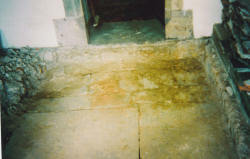 This floor was on the same level as the nave floor is now. The stonework around the entrance to the vestry didn’t reach down to that level, showing that the vestry was built after the floor level was raided, probably at the same time as the North Aisle was built. The slabstones sounded hollow and lifting them was discussed, but the archaeologist asked that the whole floor be cleared to the same level before they were touched, so that a proper full picture could be got. This work continued on Wednesday. A cavity soon began to appear at the edge of the slabs! Now the final decision on raising them had to be made. That wasn’t as straightforward as people might think. Raising them might lead on to more excavation – and we needed the church for Sunday services! In the end I decided that we should go ahead as no one else is likely to see that level of floor for many years – if at all – though I stipulated that no further excavation could take place. No more excavation was necessary! 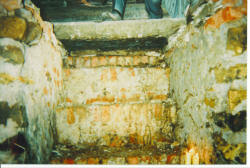 We found steps leading down from near the North side altar rail into what looked just like a tunnel. Without a light, the back wall of the vault could not be seen. The first thoughts were that we had found “the tunnel”. But it wasn’t, even though it was tunnel shaped, made from a mixture of stone and hand-made bricks which had been roughly plastered together. Inside were five coffins, four of adults and one of a child. The archaeologist began to take measurements and photographs, as did Peggy Robinson and I< all under the watchful eye of the Churchwarder Emeritus, Fred Slater, who had attended the church for a lifetime of 80-plus years without knowing about the vault. No one living did, though some had talked of seeing a `tunnel’ once. The only noteworthy thing about the coffins was that the bodies had been packed in wood shavings. The archaeologist had not come across that before. The coffins themselves were breaking up and disintegrating to a large extent. We therefore left them alone. One coffin was packed in on its side and another was partly resting on the bottom step. That one had been covered in some kind of cloth material which was now just mould. IT also had a very badly corroded coat of arms on it; but it was so corroded that nothing of it could be made out. I was very conscious that this place was a burial ground and, interesting as it undoubtedly was, it was not the place for sightseeing or curiosity. So, as soon as the archaeologist had finished, a record of our visit was left behind in the vault ( doubly sealed in two polythene bags ), a short re-commital service was taken, the stones were replaced and the vault was resealed. Many people I know were disappointed not to have seen it, but it is after all the last resting place of five people. Other members of that family are recorded in the registers; “Sparke Hughes from the Parish of Sunderland, 3rd daughter of the Revd. Watson Stote Donnison, late of this parish and wife of Johnson [indecipherable] Hughes, Mariner. Died 15th March 1807 and buried 18th March 1807, aged 31 years” – and – “James Donnison Hughes, son of Johnson and Sparke Hughes; died 15th June 1807, buried 18th June 1807, aged 1 1/2 years”. She fits in with the Revd. Roddan Douglas’s entry stating that the Beckwith Family vault was completed in 1820. So some questions remain unanswered. What is the connection between the Beckwiths and the Donnisons – if any? Or are there two family vaults under the church? Just who is buried in the vault we have found? And what about the old Vicar, Bryan Lancaster? He is buried there somewhere too. ( See the brass plate on the south wall of the Chancel ). The burials register records him: ” Bryan Lancaster, Curate, buried 11th November, 1759″. Who knows, there may still be a tunnel after all!